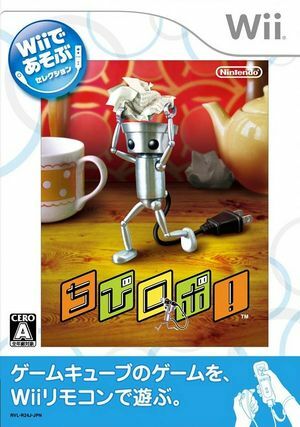 Chibi-Robo!, fully titled Chibi-Robo! Plug Into Adventure in North America, is a platform/adventure video game for the Nintendo GameCube video game console. It was developed by skip Ltd. with collaboration from Nintendo, and was published by Nintendo in Japan June 23, 2005, in North America on February 6, 2006 and in Europe on May 26, 2006. The game was directed by Kenichi Nishi and Hiroshi Moriyama, and produced by Shigeru Miyamoto. Chibi-Robo! puts the player in the role of the titular character, a tiny, 10-centimeter tall robot owned by the Sanderson family. Gameplay revolves around collecting "Happy Points" by completing various tasks from picking up trash and cleaning up spills to helping solve the personal dilemmas of the Sanderson family and the living toys that inhabit their household. Chibi-Robo! was also re-released in 2009 for the Wii as part of the New Play Control! selection. The graph below charts the compatibility with Chibi-Robo! since Dolphin's 2.0 release, listing revisions only where a compatibility change occurred. This page was last edited on 3 February 2019, at 21:30.